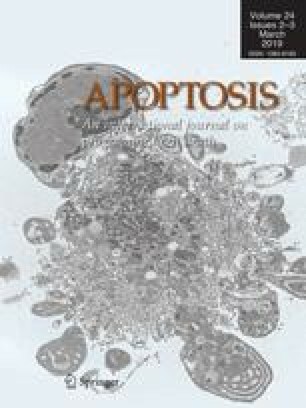 Tumor necrosis factor-alpha (TNF-α) is elevated in the serum as a result of aging and it promotes pro-apoptotic signaling upon binding to the type I TNF receptor. It is not known if activation of this apoptotic pathway contributes to the well-documented age-associated decline in muscle mass (i.e. sarcopenia). We tested the hypothesis that skeletal muscles from aged rodents would exhibit elevations in markers involved in the extrinsic apoptotic pathway when compared to muscles from young adult rodents, thereby contributing to an increased incidence of nuclear apoptosis in these muscles. The plantaris (fast) and soleus (slow) muscles were studied in young adult (5–7 mo, n=8) and aged (33 mo, n=8) Fischer344 × Brown Norway rats. Muscles from aged rats were significantly smaller while exhibiting a greater incidence of apoptosis. Furthermore, muscles from aged rats had higher type I TNF receptor and Fas associated death domain protein (FADD) mRNA, protein contents for FADD, BCL-2 Interacting Domain (Bid), FLICE-inhibitory protein (FLIP), and enzymatic activities of caspase-8 and caspase-3 than muscles from young adult rats. Significant correlations were observed in the plantaris muscle between caspase activity and muscle weight and the apoptotic index, while similar relationships were not found in the soleus. These data demonstrate that pro-apoptotic signaling downstream of the TNF receptor is active in aged muscles. Furthermore, our data extend the previous demonstration that type II fibers are preferentially affected by aging and support the hypothesis that type II fiber containing skeletal muscles may be more susceptible to muscle mass loses via the extrinsic apoptotic pathway.